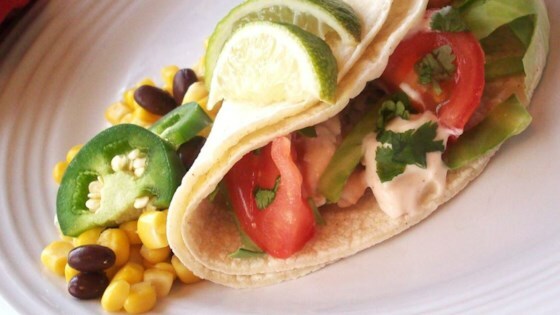 "I came up with this recipe when I couldn't find good directions for grilled fish tacos. I liked the chipotle-lime combination in a dip I once tried so I imitated it here. Choose toppings to suit your taste, or include typical accompaniments such as salsa fresca, cabbage, a squeeze of lime juice, and chopped cilantro." The only reason this got 4 stars instead of five is because the sauce isn't very good. It had a very strong lime taste that overwhelmed everything else.